Do you have a story for one of our upcoming themes? Odyssey Storytelling Series schedules a rehearsal for each month's storytellers the week before the event. The rehearsal lasts about two hours and is an opportunity to run through the stories, get feedback, and to meet the other storytellers. We offer lots of support and guidance. Want to be a storyteller? Check out the Calendar for the themes and contact us. San Francisco, New York City, Jonesborough, Tennessee, Baltimore, and Tucson, Arizona. What do these places have in common? They all are home to storytelling events that entertain, educate, touch, and amuse - the audience and the teller. You could call it the newest addition to the spoken word scene or a compelling form of personal communication as ancient as language itself. Or both. What these storytelling events share is a devotion to the art of the personal story. 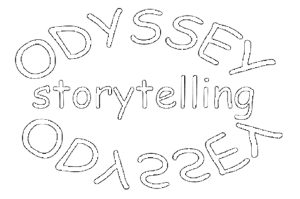 Odyssey Storytelling Series creates a safe space where people feel comfortable telling their stories. More information about storytelling can be found at Porchlight (San Francisco), Stoop Storytelling (Baltimore), Portland Story Theater (Portland), The Moth (New York), National Storytelling Festival (Jonesborough, Tn), Storyteller.net (online). This is how it works - you change your focus. How do you feel when you are afraid? How do you feel when you are excited? They both feel much the same way. Stage fright is simply excitement with a negative expectation.